Helps to regenerate the skin. 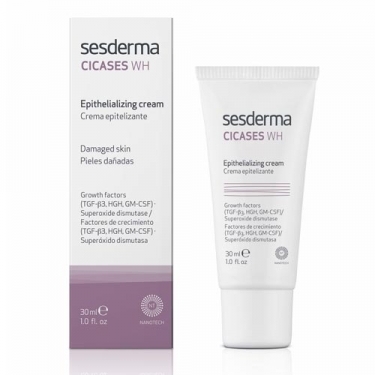 DESCRIPTION: Cicases WH Epithelizing Cream from Sesderma is a repair cream that accelerates the regeneration of the skin (wounds, ulcers, burns, surgery ...). It is indicated for the prevention of the development of pressure ulcers and protection of the surroundings. Intervening in the recovery and reconstruction of the skin with superficial lesions of the skin. It contains hyaluronic acid, ceramides and lecithin, which provide a mechanism for forming a barrier film forming action, which results in increased resistance to external aggressions. In addition, it incorporates squalene, a fatty acid that helps restore balance in the composition of fatty acids on our skin surface. Apply to the affected area once a day, preferably at night; It is necessary to use sterile gauze, spatula or disposable gloves to avoid infection of the wound: It is important not to remove letting it be completely absorbed to assist in creating a protective barrier of the damaged area; Continue to use until the skin is fully repaired.